Last night, our dinner conversation centered on an opinion piece in the New York Times titled “Don’t Let Your Children Grow Up To Be Farmers.” Author/farmer Bren Smith claims “The dirty secret of the food movement is that the much-celebrated small-scale farmer isn’t making a living.” It’s not true! We don’t claim that farming is easy but our farm (and others in Wisconsin) are proof that you can support a family on a small farm. Like many professions, the pay is low while you learn your skills. We lived frugally while starting and expanding our farm. We plowed our earnings back into the business for years but now we earn a middle-class income, like many of our customers. What would we tell Bren Smith if we could talk to him? – Don’t give up. There’s a long learning curve if you did not grow up farming. It will take time to accumulate the intuition, skills and tools that you need to be successful. Your land may need time and investment to develop too. – Work on other farms. You will learn so much while earning a wage. – Extend your season. It’s difficult to make a year’s income during a short growing season. Extend your work (and income) to a longer season with hoophouses or stored crops. 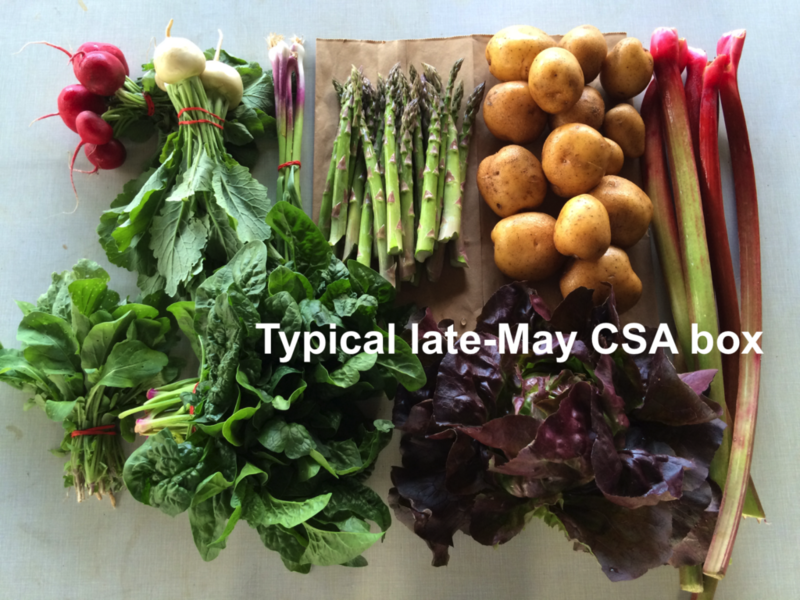 Selling stored root crops through the winter is an important part of our farm’s stability. – Understand that your income will fluctuate from year to year. Save during the good years. – Farming (like every new business) requires investment. Your friends with salaried jobs do not have to invest financially in their work, but you do. That’s how it is. Be smart/cautious/frugal in your investments, including education. – Start a food co-op. Co-ops become the hub for customers interested in local, good quality food. – Band together with other farms in your area. Smith is correct when he writes that we need to “start our own organizations — as in generations past — and shape a vision of a new food economy that ensures that growing good food also means making a good living.” Our farmer coalition FairShare is an excellent example, in its efforts to foster the CSA marketplace in Wisconsin. We think farming works in this region because of the consumers. That’s you, Tipi members. People in this area are willing to seek out, pay for, and eat food from small local farms. Each of those steps is a hurdle for the average customer. Whether through CSAs, farmers markets or local stores, people in this area support local farms and are rewarded with fresh, great-tasting food. Thank you all. Sign up soon for Bike the Barns. Bike the Barns will be held Sunday September 14. Learn more and register here. Hosted by FairShare farms, the annual ride is the primary fundraiser for our Partner Shares program. This year’s ride heads northeast from Madison, for either 45 or 60 miles. Don’t wait if you plan to join the ride. Registrations often fill by late August. We hope to have extra basil and extra slicing tomatoes to sell during the next month. Watch for emails from me. It will be a few more weeks before we have plum tomatoes to sell. 4. They might be partially red and partially green. The eating quality is fine (or excellent) for all these #2 peppers. We throw away all peppers that we suspect have rot inside (although one may occasionally slip through in either #1 or #2 grade.) Today’s peppers are #2 grade. Be prepared, this box is very full and very heavy. We will send everything on this list, as long as we can fit it in the box. Next week’s box will probably contain melon, tomatoes, peppers, cilantro and more summer goodness. Sweet corn – This is a new variety, picked at its peak. It’s more creamy and less sugary than the variety we sent last week. Steve says this variety achieves the ‘old-fashioned’ flavor of the varieties he grew years ago. Melons – Everyone will get a muskmelon (netted skin, orange flesh) or a yellow watermelon (sweet, yellow interior) or an orange watermelon (pale orange interior, sweet, tender).